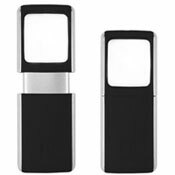 There are many low vision aids items available on the market today to assist people who are visually impaired in one way or another. They are easy to carry and can be very helpful during the times you need to read the fine print. Some may even save your life by telling you the time. Pocket magnifiers, low vision glasses, and talking alarm clocks are among the most useful. A pocket magnifier is a low vision aid that is small in size, portable, lightweight and easy to carry wherever a person may go. They are convenient to use when someone wants to see things up close. For example, if a person with low vision wants to read a book or magazine, they can simply wave the pocket magnifier over the page and see the words without straining. These magnifiers also come in a traditional circular lens form. Usually, low vision glasses attach to a regular pair of glasses. They can then assist the user by magnifying images without strain, and are useful for people with both near- and far-sightedness. If you need to view a computer screen at a reasonable distance, these magnifying lens glasses will do the trick. They are perfect for viewing and working with intricate needlework or soldering. By using these glasses, smaller and harder to read text will be magnified, and the wearer should see much better than they could without them. There are many types of talking alarm clocks for seniors, with models that run on electricity and batteries being available. A talking alarm clock will, with the press of a button or when scheduled to do so, announce the time in a loud voice. This is useful for people who are blind or have low vision. 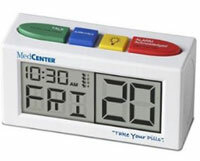 Talking alarm clocks are also great for the elderly who need daily medicine reminders to take their scheduled medications. For someone who needs equipment to remind them to take their medicine, these talking alarm clocks are life savers. The models that run on electricity can be placed wherever the user wishes in their home or office. The battery-operated talking alarm clocks are useful when traveling. While these low vision aids may not correct a person’s vision completely, they will make life more convenient when one uses them. Many manufacturers have made these items available at low costs and using them can improve the life of the user dramatically. Here is a list of the best low vision aids to buy as seen in the images above. Pocket Magnifying Lens – Comes equipped with a LED light for illumination. Fits easily in pockets and purses. Take it out when you cannot read the small text on restaurant menus. Circular Magnifying Lens – This magnifying lens has 5x magnification power and is great for documents with fine print. Talking Alarm Clock – Push the button on this talking alarm clock and get the time in AM or PM along with a nice greeting. Clip On Magnifying Glasses – Simple to put on and simple to take off for anyone who needs magnification on their standard glasses. They flip up and can be left on the glasses.